The TYTON is a phantom vintage plastic model kit of an unrealized American luxury submarine, and is split to view the many rooms. 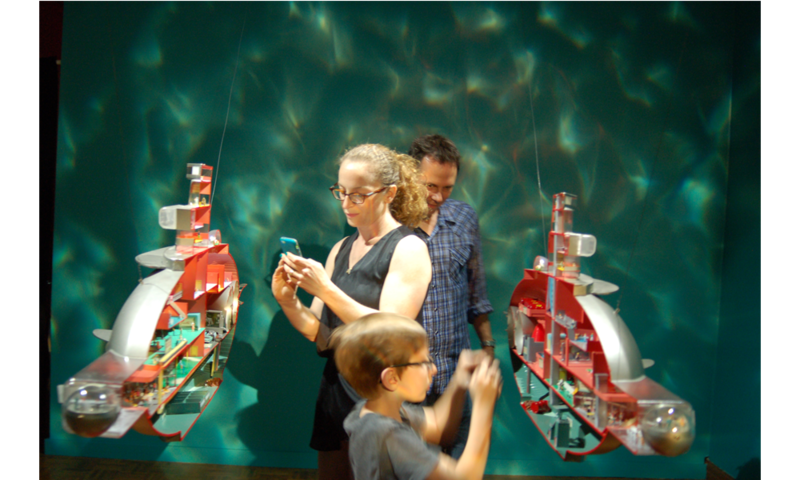 The submarine is built of found and constructed objects. The ship is 50 inches long by 22 inches tall and 14 inches wide (with the halves together). When installed, the multimedia project includes a half-hour soundtrack to which Salina writers and actors contributed. LA based Director/Screenwriter Gail Lerner created and directed the audio narrative and cast and and NYC based Kevin Shand worked in tandem with Lerner to handle all of the sound and recording duties. Bill North, Director of the Salina Art Center in Salina, Kansas deserves all credit for the funding and impetus to herd this multi-faceted work into the world. The three close-up images of “The Three Sheets to the Wind Club,” the “Jonah’s Witnesses Prayer Room,” and the “Dive-In Drive-In Theatre” were captured by Tom Dorsey / Salina Journal.